Thirteen metals occur as native elements. Obviously gold and silver are the most well known, but Native Copper is actually more widely collected by collectors because it is more abundant and more affordable. Copper is believed to be the first metal that man started utilizing. By 10,000 BCE, early metalworkers were hammering native copper into simple tools. Eventually that brought mankind from the Stone Age to the Copper Age! Even today copper is still a very important metal in many industries including electrical, building and automotive. Copper is found all over the world and there are still many active copper mines. They are usuallly owned by large coporations and many are huge open pit mines. Native Copper can be found in many formations. In masses, scales, plates, wires, branching aggregates and crystals. Native Copper is never pure, and it always contains varying quantities of other minerals or metals. Often the Native Copper is encased in a host matrix rock. Sometimes that rock is cut and polished making a strikingly beautiful piece with sparkling copper dots or splashes. One example of this is the Native Copper we sell from the Chino Mine in New Mexico. The Native Copper is encased in a granitetic epidote host rock. Most of the copper in the earth's crust is combined with sulfer in copper sulfide minerals such as chalcocite or chalcopyrite. These materials when mined must be milled and floated to recover the copper. These materials are collected as mineral specimens but are rarely cut and polished. One notable exception is the lovelly gun metal purple Covellite found in Montana and Peru. Some copper is in copper oxide minerals such as chrysocolla and azurite. These are the ones most prized by lapidary cutters as the copper gives these semi precious gemstones lovely coloring of blues, greens, and sometimes red. Even though it is not actually considered a copper gemstone, Turquoise gets its blue coloring from the presence of copper. When copper oxides are mined for copper the material must be leached with acids to recover the copper. OakRocks has been in the rock and mineral business for 30 years. 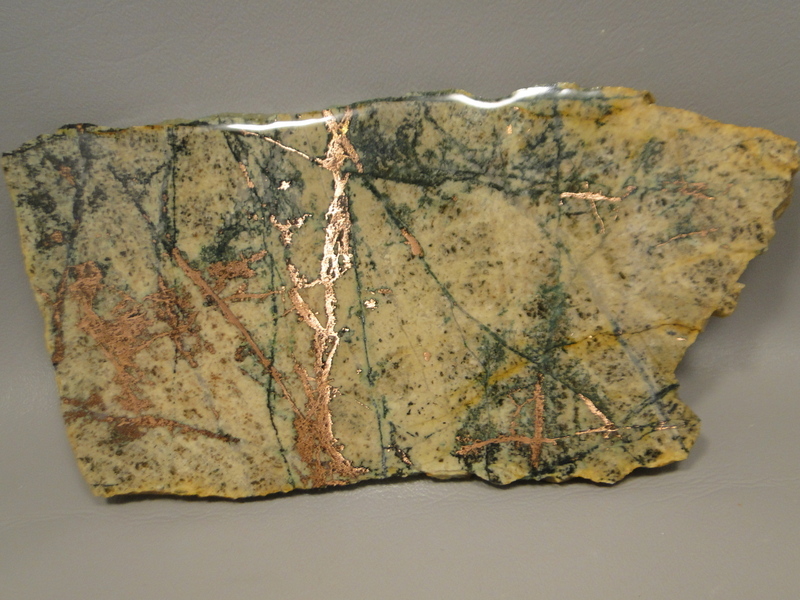 We are a great source for Native Copper and carry a large selection of slabs (both rough and coated) and cabochons. We have actually specilaized in Copper Gemstones for over 30 years, and at one time we had a mineral recovery contract with the Bagdad Copper Mine in Arizona. Bruce is the renowned expert on Chrysocolla and is truly a master at cutting and polishing it. For more information about specific copper gemstones click on one of the links to your right.